They were walls that existed hundreds of years ago - of buildings to house royalty and even deities. Today they are reduced to "ghost walls". In Lathiya, Uttar Pradesh, the existence of a bustling temple complex has been traced by archaeologists just by unearthing these invisible walls. It was a tall stone pillar perched atop a huge mound that first attracted the attention of British archaeologist Alexander Cunningham to the site in Lathiya, a small village in Ghazipur district, around 150 years ago. 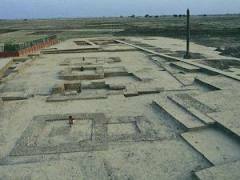 Only in 2009-10 did a team of the Archaeological Survey of India land at the site, and painstakingly unearthed the evidence of an early Gupta period - about 320-550 AD - temple complex. The buildings no longer exist. The bricks and stones that made up the walls were over the years taken away by nearby villagers for their own house construction and even by the British for use in a railway line. "Many of the bricks of the ancient temples had also been taken away for laying the East India Railway line in 1862. The line passes about a km away. "An aerial view of the different colours of the soil - on the foundation and that lying around it - gives a complete picture of the plan of the structure that once existed. Ghost walls is an archaeological term. During excavations, many artefacts from the Gupta era were also discovered, including pottery, bone, shell, ivory objects and coins. The stone pillar, 22 feet high, is of special interest. It is surmounted by the figure of two garudas, sitting back to back, and resting on lotus petals. The pillar with the garudas is similar to the Ashoka pillar of the Mauryan dynasty (321 to 185 BC) with its four lions sitting back to back. Sarnath, where the Ashoka pillar is located, is around 100 km from Lathiya. In Bhitari, another site in the same district, an inscribed Gupta pillar stands near a temple. Near the pillar is a stone block with an image of garuda. "The garuda once stood on top of the pillar but had toppled over. "The garuda was the state symbol of the Guptas and was an embodiment of the power of the state. The garuda was the royal insignia of the Gupta dynasty. Even the four temples, discovered through ghost walls, at Lathiya are of typical Gupta period design. The temples comprise a square garbhagriha, or sanctum sanctorum, and a verandah in front. The temples had a flat roof. Such temples were also found in Sanchi. The stone pillar at Lathiya was a dhwajasthambh or a religious pillar erected in front of one of the temples. The temples could have been Vaishnavaite, dedicated to Vishnu. The temples faced the west and not the east. "This was so that the rays of the setting sun would light up the temple and also when devotees entered the temple they would be facing eastwards. After the temple walls were vandalised over the years, the local villagers began worshipping the pillar as a symbol dedicated to a Devi or goddess. A house complex was also discovered near the temples - albeit only through the ghost walls. "People attached to the temples would have probably been staying there. Among the many antiquities discovered at the site is a terracotta human figure, typical of the Gupta period. Many broken pottery shards were also found, including many with spouts with the figure of the varaha, or boar. "These were ritualistic pottery. There was also evidence that the temple performed sacrifice, adding that animal bones were found in a pit. The archaeologists found evidence of an earlier Chalcolithic (1800 - 1000 BC) period beneath the Gupta remains.